We have compiled a list of the best walks in Buxton, the Peak District and Derbyshire! Buxton and its surrounding areas are famous for beautiful scenery and gorgeous nature walks. We have chosen some of our favorites, that we think are unmissable if you love a good stroll. To fully experience Buxton´s beautiful woodland, try the Ring of Trees walk. The full walk is roughly 10 miles and takes you right around the town through the woodlands. Allow 4-5 hours to complete the full walk, or if you prefer a shorter version the Ring of Trees walk never strays far from the town, so you can dip in and out as you please. Visit the Buxton Civic Association website for more information and a map of the route: click here. We also highly recommend walking through Grin Low Woods up to the summit, where you will find Buxton´s own folly, Solomon´s Temple. At the summit you can take a hard-earned rest while enjoying the breath-taking views of Buxton and the peak District. On a clear day you can see for 15 miles, so check the weather, pack a picnic and make a day of it! Grin Low Woods will offer shade on a hot day, and the sun streaming through the trees makes for a beautiful walk, with a variety of fauna and wildlife to be spotted. Walk around the Pavilion Garden, a botanical garden which showcases beautiful Victorian design from 1871, with the Octagon Hall, bandstand and gift boutique. The Octagon Hall is set to be reopened in late 2018 after undergoing refurbishment, and is the host of numerous local events, such as a farmers market, concerts, Victorian markets, and much more. 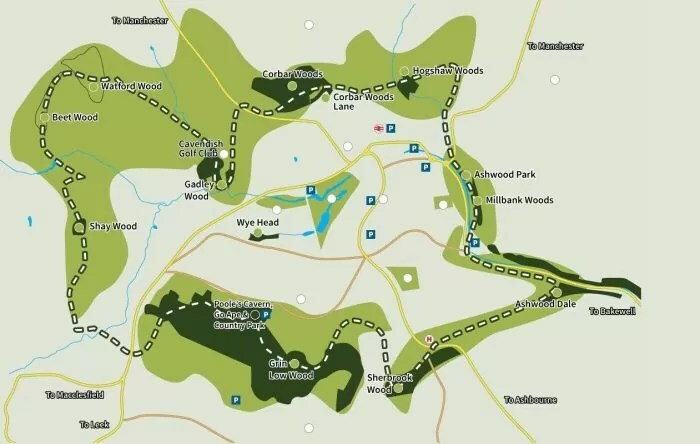 If you are interested in the industrial past of the Natural Park, why not walk the Buxton Coal Mining trail? With some guidance it is still possible to see the disused mine shafts (which have been sealed off). The trail starts at Cistern’s Clough and takes you over the moorlands above Buxton. Read the Buxton Civic Association´s article for more details. The Corbar Cross walk will take your through beautifully natural woodland and carpets of bluebells with green as far as the eye can see. At the summit you can enjoy the breath-taking views of Buxton and the Peak District. Remember to pack your camera, the views are definitely worth the walk! There aren´t many pubs or shops along this trail, so make sure to bring water and snacks with you. It isn´t just Buxton that can offer you beautiful scenery and walks. Explore the surrounding area and enjoy these beautiful trails too. Which one is your favourite? The Ladybower walk follows a circular route around the reservoir and is about 6 miles long. It offers stunning views over the reservoir and of the surrounding nature, making it a must-see on a clear day. It is accessible for almost everyone, as it is mainly on predesignated paths. Difficulty level: easy. The Goyt Valley and Errwood Reservoir offer a beautifully wild experience, which numerous different trails to discover. Free parking around the reservoir makes it easily accessible and there is an assortment of different walks with various difficulties from 2 miles to 15 miles long, with the shortest walk offering a wheelchair friendly path so that everyone can enjoy the wonderful Goyt Valley. Sights include Errwood Hall ruins, which is perfect for playing hide-and-seek with the kids, and the walk to the Hall is beautiful too. Nearby you can visit the Shrine, where you can take a rest and enjoy the peaceful scenery. Derbyshire Bridge is one of my favourite walks. It is peaceful and can go on for as long as you want on the particular day. There is a carpark at the bottom and it is just one long path. If you are feeling adventurous, why not try to walk from Macclesfield Old Road in Buxton to the carpark at the end of the trail. The straight walk is about 4 miles in total. You can also access the Goyt Valley from this trail. Difficulty level: average, due to changeable terrain throughout the year. Kinder Scout is probably the most famous yet most challenging walk within the Peak District, being the highest point in the National Park, but this makes it all the more rewarding. During the route you will encounter the Mermaid´s Pool, the Kinder Downfall (the tallest waterfall in the Peak District). This walk is probably so famous because it lead to the creation of the very first National Park, coupled with its difficulty. Remember to bring plenty of water, maps, walking boots and a compass with you, as the moorlands can sometimes be tricky to navigate.